Host a local event at which you bring the message about why you are ProudtobeGIM to medical students and encourage them to enter into the field. This could be a panel session, brown bag, or some other speaker-related session. Your institution might even consider a virtual event. Using our ProudtobeGIM messaging and the hashtag #ProudtobeGIM. Click here for sample messages. Help SGIM distribute our messaging about the event – for example sharing our videos, etc. Click here to visit our YouTube channel. Who Is The Perfect Fit for General Internal Medicine? How can students tell if they are the "perfect fit" for general internal medicine? Our physicians have the answer. 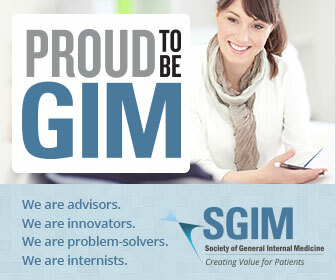 ​Want more information on getting involved in the ProudtobeGIM campaign? Contact Francine Jetton, SGIM Director of Communications.